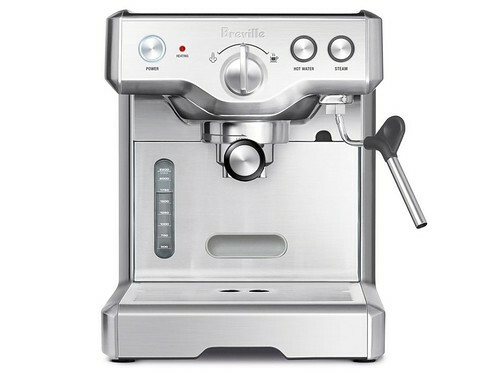 The Breville Duo-Temp™ 800ESXL — The die-cast metal body has a 4.5″ clearance that accommodates larger cups — ideal for espresso variations like Americano, cappuccino, and caffe latte. With the unique 15 bar Triple-Prime™ pump, increased pressure during extraction allows the machine to extract more crema, and gives the coffee a rich, smooth taste. A. Cup Warming Tray. B. HEATING light. C. POWER button. D. Portafilter. E. Removable 75oz. (2.2L) water tank. F. Water Level indicator. G. 4" Cup Height Clearance. H. 'Empty Me' drip tray indicator. I. Removable drip tray and grill. J. Selector control. K. HOT WATER button. L. STEAM button. M. Group Head. 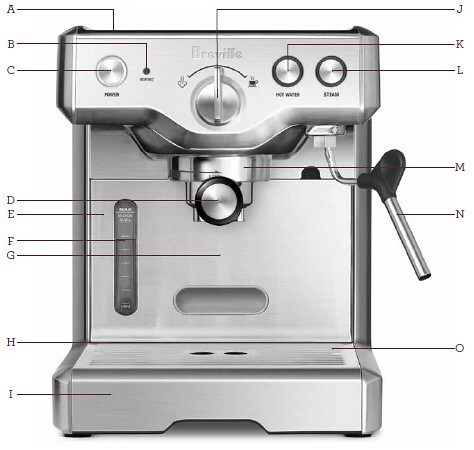 N. 360° swivel steam wand with froth enhancer. O. Concealed storage tray for cleaning tool and filter cups.